A year of anticipation. A year of preparation. 12 weeks of intense, focused training. 3 weeks of competitive banter with a dailymile running friend. 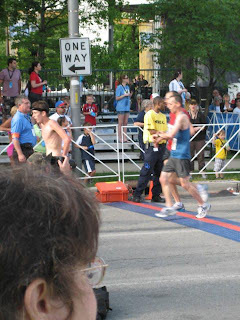 All of this led to a 1:32:39 13.1 mile PR effort at the One America 500 Festival Mini Marathon on 5/5/2012. I ran my first half marathon here a year ago and I was hooked on racing. 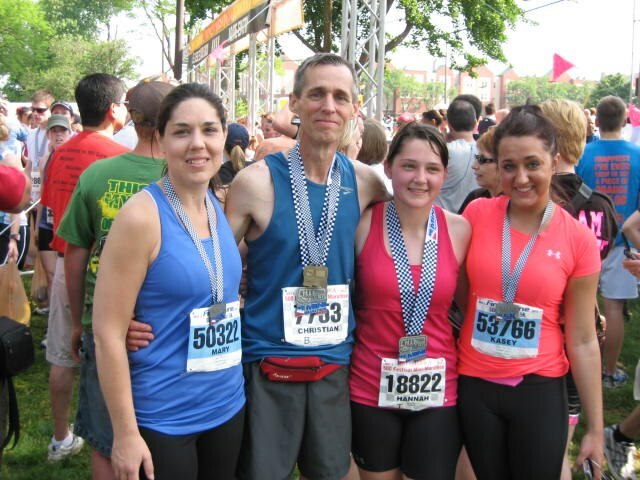 I knew when I crossed the finish line in 2011 that I would be running more races. I knew that I would be back for the 2012 running of this race. What I didn't know is how much faster and how much more competitive I would be. In other words, I have been looking forward to this race for a year. It has been a primary focus of my life for the last 12 weeks as I went from my regular running to an intense focus on preparing for this race. The mini is the largest half marathon in the country. 35,000 people run the half marathon and another 5000 run the accompanying 5k for a total of 40,000 participants. Factor in these people's family and other spectators and downtown Indianapolis gets swamped with people. Furthermore, we live about an hour and a half from downtown Indy with no traffic. For these reasons, we put out the money for a hotel room right downtown on the start line. Lesson learned from last year, arrive downtown in plenty of time to deal with traffic, get checked in, deal with the wait for dinner and still make the expo in time for packet pickup without stressing. We got to our hotel and checked in by 2:00 PM. First we visited the expo got our packets and browsed through the various vendors. Downtown Indianapolis is well laid out with almost everything with in walking distance. We walked from the expo to the Spaghetti Factory for a traditional pasta dinner. After dinner we made our way back to the hotel for a good night's sleep. Spaghetti Factory spaghetti. This is alone worth all of the training! Hannah and me getting ready to crush some carbs! It was a family affair this year. My wife and oldest daughter ran the 5k while my youngest daughter and I ran the half. 5k participants had to be lined up by 6:45 AM for a 7:00 AM start. The alarm went off at 5:15 AM and the streets were already coming to life with news crews and some participants. We made our way out to the starting area. My uncle and a close family friend came all the way from Cleveland and Columbus OH respectively to support us in our race. They made it just after the 5k participants lined up so we walked around and met up with them for a few minutes before we had to line up. It was great to know that we had such support. A great thing about this race is everything goes off like clockwork. a 7:00 AM start is a 7:00 AM start, not a 7:10 AM start. When your starting corrals look like this, you had better be organized. If you are still with me you must be really interested, so I will get onto the details of my race. I was feeling very confident going into this race. I had trained hard. I was prepared. I was starting pretty close to the front. The Indianapolis Mini Marathon is a great race for the big race experience. That being said, if you are starting anywhere but upfront it can be very congested at the start and in the Speedway. But, if you have done well enough in a previous race to start near the front, you get the big race experience with out the frustration of the congestion that necessarily comes with it. Luckily, I had run a good enough effort last fall to be seeded in corral B and I didn't have to deal with the congestion. Finally, this was it, we were starting. I made the Sign of the Cross and offered the run as a prayer. Almost immediately it looked like it might all go bad. Before the first mile was up, my breathing was labored, my quads were on fire and my shins felt tight and uncomfortable. What the heck? This is not how it was supposed to be. However it seems that it may have just been nerves because at some point it all went away. I settled into a pace and got into a running groove. I began to enjoy the entertainment which was, in the first half of the race, almost non-stop. But more so, I enjoyed all of the people who come out to cheer on the runners. What a smile many of them brought to my face with their cheers of encouragement. Great people in Indianapolis! Before I knew it we were approaching the Indianapolis Speedway. This is a pivotal point in the race. You go into the speedway at about mile 6 and come out at about mile 9. As you are coming in you can see the runners who are exiting the track. What I saw exiting the track was the lead car and a group of about 5 runners behind it. This means I was only about 2.5 miles behind the leaders. It was probably the single most exciting thing that I have seen while running. Once out of the speedway, there is just about 4 miles left in the race. I had been challenged on dailymile by a childhood teammate, Brian Vinson to a virtual race. While I was running in Indy, he was running in the Capital City Half in Columbus OH. The competition provided a lot of fun and extra incentive leading up to the race. I had been running at or a little below a 7:00 minute/mile pace for 9 miles already. I was getting tired but the competition was now in the forefront of my mind and helped me to maintain close to that pace for the final 4 miles. As I was making my way down victory mile it didn't even dawn on me that there might be the slightest chance that I would finish in the top 500. But as I crossed the finish line A volunteer handed me a medal and said "Congratulations, you finished in the top 500!" As exhausted as I was I couldn't help but feel another surge of adrenaline. I finished in the top 500, out of 35,000 (see the image above!). Me crossing the finish line. If you are a runner you know what I am doing. For those of you who are not runners the single most important thing to do while crossing the finish line is "pause the watch!" Running, at my house it's a family thing. My time official time was 1:32:39 a PR by about 4 minutes and nearly 18 minutes faster than last year. It was 2 minutes and 40 seconds over my goal of 1:29:59 but all in all a great run. The rest of my family did great as well. My Oldest daughter finished the 5k in 29:45, my wife, on a bad knee, finished the 5k in 30:40 and my youngest daughter finished her first half-marathon in 2:19:41.